يوفر فندق منتجع شاتو بيتش سايد ظروف إقامة راقية وهو خيار رائج للسياح ولرجال الأعمال أيضاً. يقع في منطقة شواطئ, الحياة الليلية, تسوق من جولد كوست. لا يبعد الفندق كثيراً عن مركز المدينة، فهو يقع على بعد 1 km منها. في حين يستغرق الطريق منها إلى المطار حوالي 30 دقيقة. إن سهولة الوصول من الفندق إلى المعالم السياحية الشهيرة الكثيرة في المدينة كمثل Racecentre, اورشيد افينو, Infinity هو استثنائي بحد ذاته. إن الخدمات الممتازة وحسن الضيافة العالي في منتجع شاتو بيتش سايد تجعل إقامتك تجربة لا تنسى. يمكن لضيوف الفندق الاستمتاع بالميزات التالية على أرض الفندق: تخزين الأمتعة, واي فاي في المناطق العامة, صف السيارات, غرفة عائلية, مرافق للشواء . تنعكس أجواء منتجع شاتو بيتش سايد في غرف الضيوف.تلفزيون بشاشة مسطحة, مسبح خاص, غرف لغير المدخنين, تدفئة, خدمة الإيقاظ هي بعض الميزات الموجود في العديد من الغرف. كما أن مجموعة الخدمات الواسعة الموجودة في الفندق لضمان راحتك تترك لك الكثير من الخيارات لقضاء وقتك أثناء فترة إقامتك. إن منتجع شاتو بيتش سايد هو مكان مثالي للمسافرين الذين يتطلعون إلى الراحة والاستجمام في جولد كوست. يفرض العقار مبلغ تأميني للمفتاح بقيمة 200 دولار أسترالي/غرفة. A bond of $200 at check in is way above most 4/5 star hotels, also a note to say it could take up to 40 days to return it. They would only let us park 1 hr past check out,never happened at any hotel before and no air con in room is past ancient! Plenty of other hotels in area don’t have these issues. Won’t be back. The views from my beachfront room were spectacular, but the room is old and it shows. The door doesn't seem very secure and it is quite banged up. The place has seen better days. There also is no air con, so it got quite loud with road noise and I had to keep the windows open to stay cool. Close to restaurants and supermarket. Friendly and helpful staff. Great location, spacious room, its clean but a bit old. The airconditioner is not cooling the whole place however over all stay was good and relaxing. 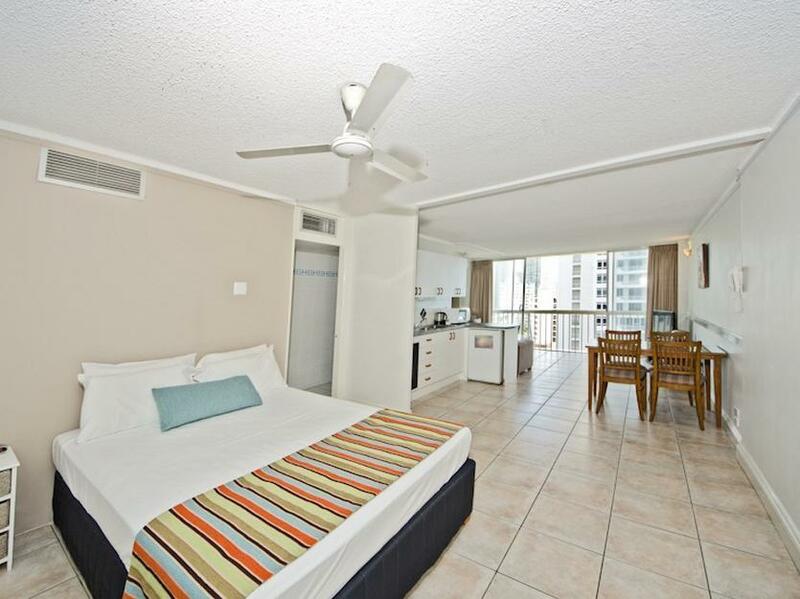 Clean comfortable rooms straight across from a patrolled beach walking distance to shopping ..restaurants and great places to have a cold one. 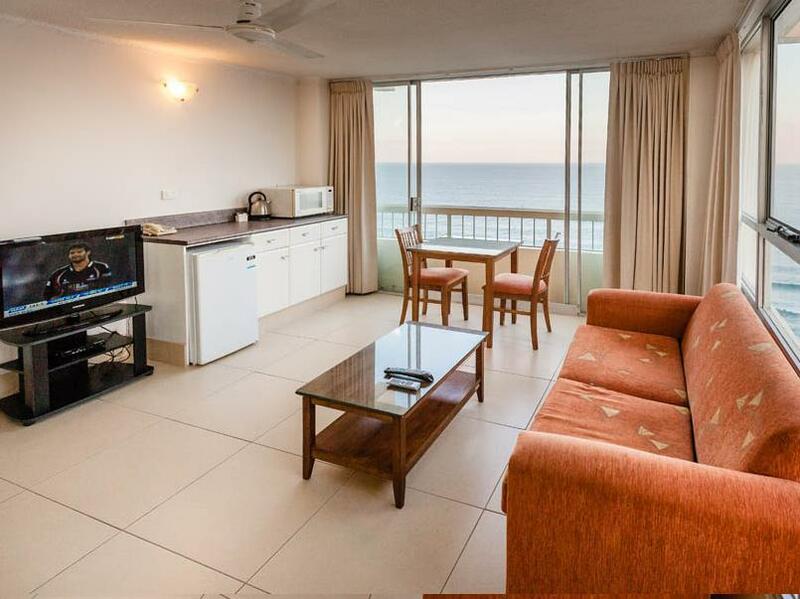 ..great pool..family BBQ area...spa's and suna and being on the 9th floor facing east over looking the ocean no need for air con as a beautiful sea breeze makes it way into the room everyday room also has ceiling fan. General wear' n' tear from years of use so some general maintance is due to keep it looking a great place to stay. We certainly will be back. Our room had a great ocean and swimming pool view. We loved their spa and the steam bath. Good for the cold August weather. Quite strict with the checkout though, we know it is 10am and we left the room just before 10am and went straight down the parking lot to load our bags before going to the recep area to check out. The lady then said we are already passed the checkout time for 15 mins and we should be paying 5 dollars additional. Ridiculous, I thought. Then we asked if can leave the car at the parking lot to grab a quick breakfast right in front of their hotel where the breakfast voucher they sell can be consumed. And she said no, definitely you can’t because you are pass the check out time. The parking lot was almost empty... we just wanted to eat something before we drive back to Bne. 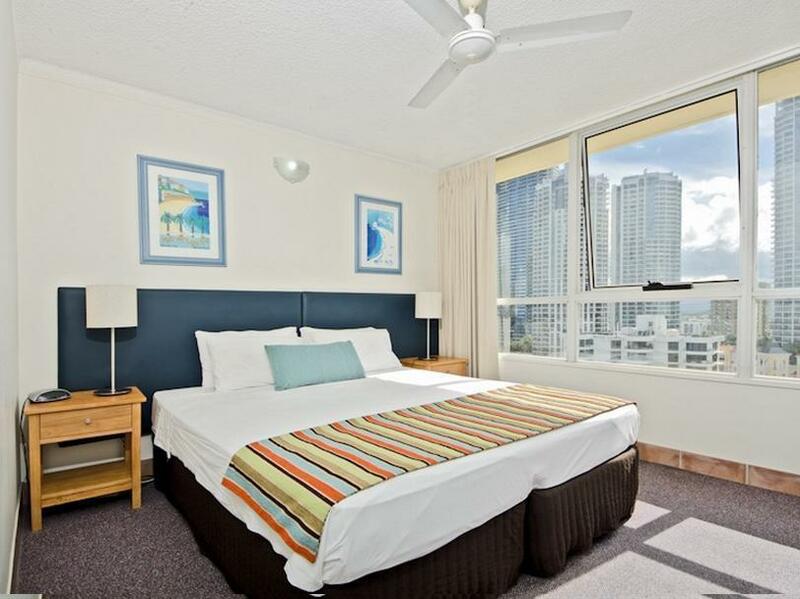 Anyone that complains about this hotel is just a whinger as we have stayed here many times and for what you pay to be in the heart of surfers Paradise it certainly ticks all the boxes.I think people seem to want 5 star accom for approx $90 a night, Come on ! We always find it to be a great hotel,thanks again for having us and we will be back. Had a girls weekend out. 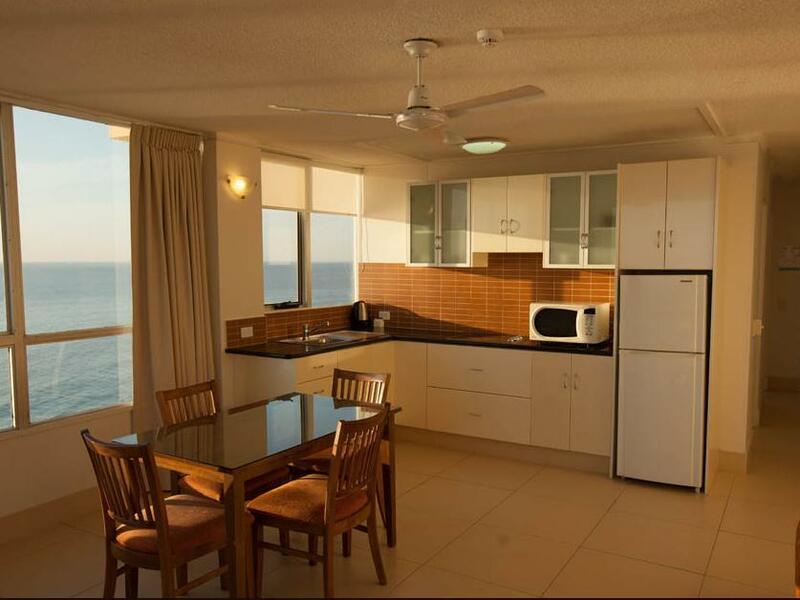 Great location, close to many food places, right above the Sand Bar which have great meals and awesome coffee.... Room boasted spectacular views, room was clean and tidy, bed was comfy... No air con in the room so it was a bit toasty at times. Good little gym, but no fans... Overall we really enjoyed our stay and would definitely stay again. Check-in time is a promise between hotel and customer. but this hotel gave me a room at 5:30. someone who wants to stay this hotel, please make sure they can give you a room after 2pm. check-in time is meaningless. This is extremely unusual for our hotel. Unfortunately once a year we have the Schoolies festival . You arrived on the day of 297 schoolchildren checking out. Everyone who had to wait got a free 2 hour late checkout. Most people were very understanding. Rude receptionist when I asked about the room booking and requestion on floor she was given since I wanted to get a higher floor. She laughed in insulting way at me with her colleague when I was about to left. Hu Thy You booked and paid for a room located between the first and seventh floor. Great location, horrible staff had major problems getting WIFI staff member said i had my limited and would'nt give me any more so i couldn't check-in for my flight. I tried to show her i was staying longer then she thought she wouldn't listen and kept cutting me off saying WIFI is a privilege!! these days its not as every hotel offers WIFI FREE. When you have more then 2 people on WIFI 500MB isnt much to download photos or look bookings, tours etc up. City rooms dont have knife and forks or plates but has microwave which is useless if you dont have knife and forks to eat with. No dishwashing liquid or brash or cloth to clean up with. Room badly in need of renovation (especially bathroom) but clean and comfy. 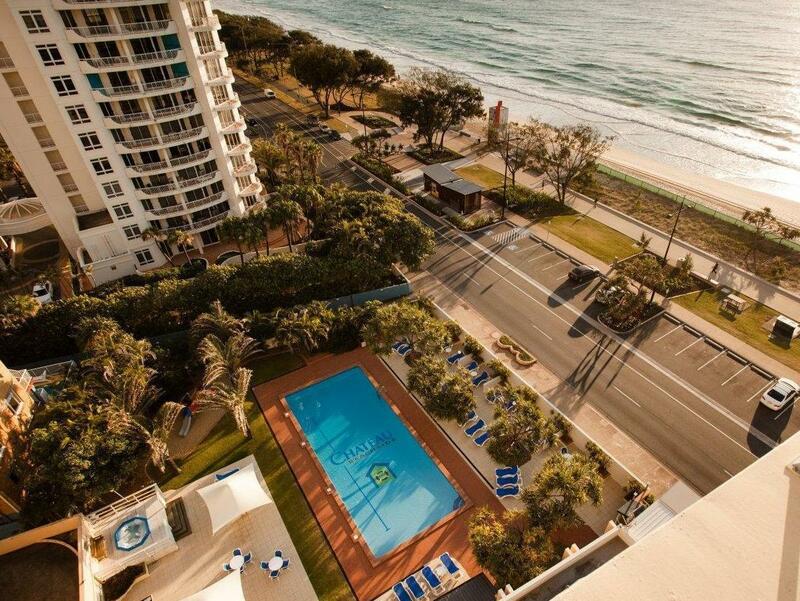 Fantastic location opposite beach. Hotel has good facilities with pool, sauna, spa, steam room, tennis court and bbq facilities. booked for 5ngts, got one nights internet of 500MB, next day asked for internet as 500MB. Rose (staff member) argued that I had 2 nights worth of internet, even though I told her the truth (why lie over internet) she got stroppy and aggressive towards me not believing me. She tried to ignore that I was there pretending to be busy. She finally gave me 1GB for the 4 days left saying "THAT WAS MY LOT THAT INTERNET WAS A PRIVILEGE NOT A RIGHT" I said "everyone offers it so there is no privilege". For my whole stay this lady ROSE was abrubpt, and rude every time I asked a question. As for city view room, they are loud and noisy rubbish trucks come 5AM nearly every morning . There was no cutlery or plates even though there was a microwave no cleaning products to clean cups or teaspoons. BEWARE ITS LIMITED INTERNET also there was no internet for customers for the last 2 days I was there still not fixed the day I left. 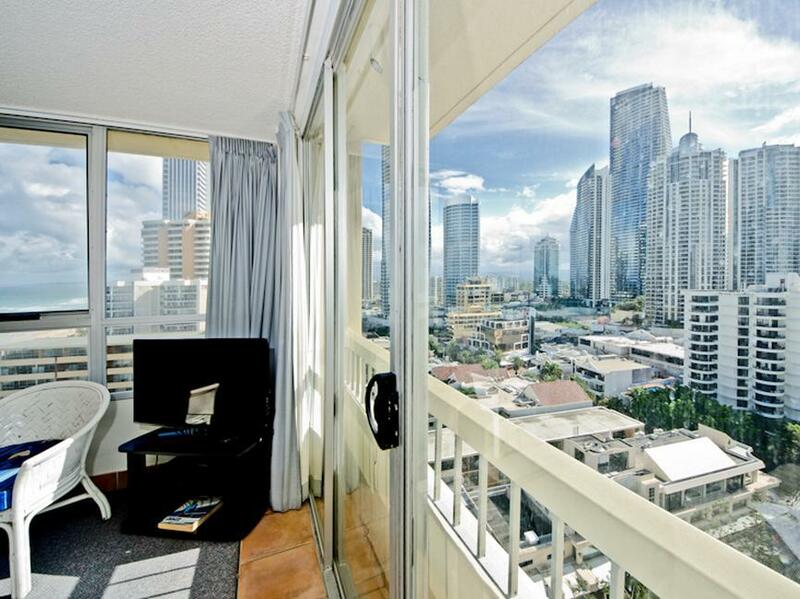 Apartment is in a prime position in Surfers Paradise with alot of reasonably priced restaurants around. Apartment did not have air conditioning so not sure how it would be in the heat of summer. Also no balcony although glass doors open to outside. For the price it is good value however with the two staff members when I checked in and a different two staff when I checked out, I didn't see one smile. Also they charge $200 deposit which you don't get back for up to 40 DAYS which is ridiculous and should be changed. They said it was the credit card company but I have used the same credit card all over the world and have never come across this before. Apart from these few things it was an enjoyable stay.